Hi, friends. It's been a while since I posted. It was almost three years ago that I made Challah using the ITJB formula for Honey Whole Wheat Challah. That was an excellent bake. Poofy and Fluffy and Yeasty and Delicious. At the time, I promised myself to try that formula with Double Knot Rolls. And this weekend I finally did. I baked the longest acronym I ever baked…HWWCDKRs. They are very photogenic. They tasted good, too. 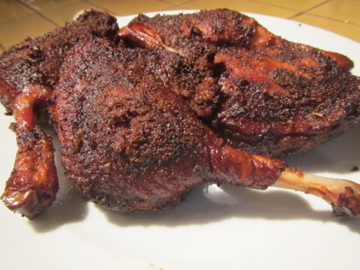 This was a good roll to have with Pastrami-Spiced Barbecued Duck Legs (PSBBQDLs). 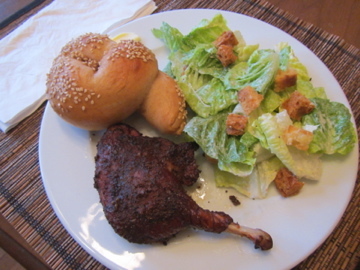 And here's the whole meal. 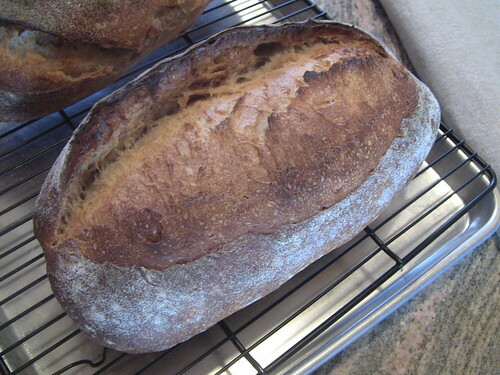 Coming up on four years since I first tried to bake bread. 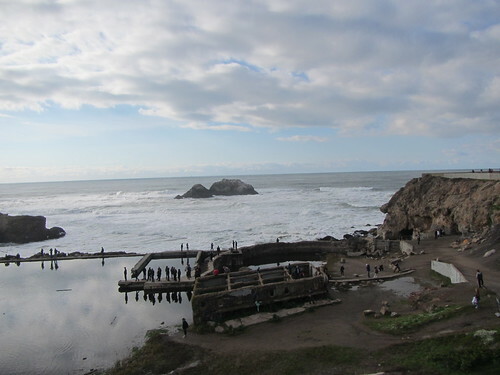 The history has been kept here in my Fresh Loaf blog. 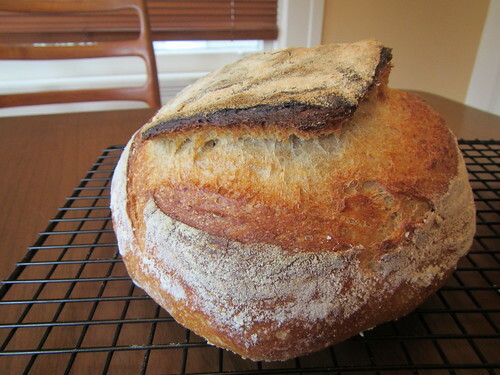 For the first two years or so, I baked almost weekly (and blogged often weakly). Then, as my experimentation yielded satisfactory formulas and techniques, the baking became a bit less frequent and the blogging much less frequent. I have continued baking, maybe once or twice a month. And I remain an active evangelist for Carbotarianism. 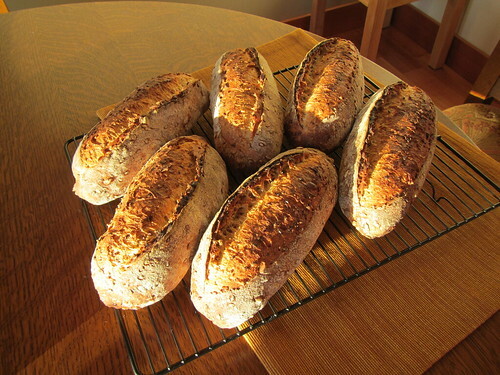 Recently, due to a busy work schedule and then a vacation, I went about six weeks without baking bread. The freezer stock was depleted, and my Number One Bread Fan commented on the dearth. So....I baked her favorite, and mine: San Francisco Country Sourdough. I feared that I might have forgotten how. But the old saying is true: once you learn how to fall off a bicycle, you never forget. The result was very satisfactory. I want to give thanks again to my wonderful mentors and friends here at The Fresh Loaf. Hope all are well. I haven’t posted a blog for some months. I have been baking regularly, though not every week. And not much that’s exciting for a blog post (since when did that stop me, you say?). Plus life has a way of shifting my familiar patterns every so often. And bread-blogging has given way to other things. But this weekend is quiet. My spouse is on a long business trip around Asia. I’m spending a quiet evening trying to provide for a kitty who’s used to two laps. Listening to the rain (a blessed sound in the midst of our long drought). The big news in our San Francisco kitchen is we replaced the burner elements in our old stove, and it now really works well. 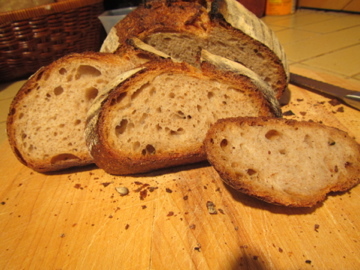 I’ve been baking various simple sourdoughs and Hamelman’s 5-Grain Levain and bagels and challahs, all of which continue to be very satisfactory but not novel in any way. My skills are holding steady; I think real improvement takes weekly baking at least. But today, for the second time, I tried Bernard Clayton’s Blue Ribbon Bread, which ehanner (http://www.thefreshloaf.com/node/4329/po-boy-victory) and Txfarmer (http://www.thefreshloaf.com/node/24960/new-orleans-poboy-bread-it039s-all-eric039s-fault) have blogged about as the right bread for po-boys. 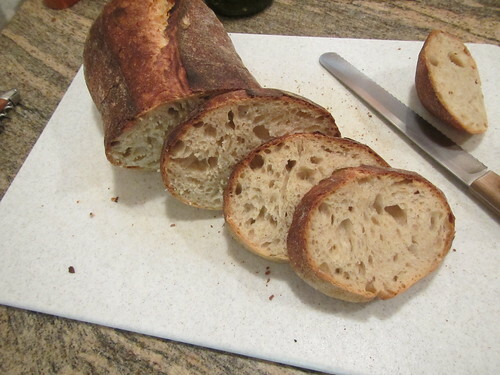 I used the formula and method Txfarmer recommended, except I made two different shapes, one short baguette and one long batard. 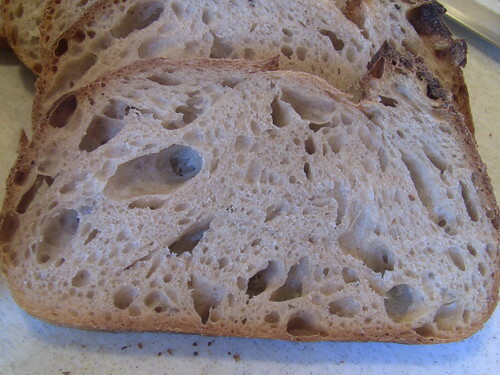 The texture is nice, and close to authentic, but the crust is not as crispy as it should be and the crumb is a bit heavier—less airy--than it should be. It was good for French Dip sandwiches, but a po-boy with this bread would be too bready. S’long as I’m posting photos, here’s one from our trip to Edinburgh last October. Hope all the TFL Gang is doing well. Howdy TFLers. Been a while. I just wanted to check in and say hi. I continue to bake, though not every week like I used to. 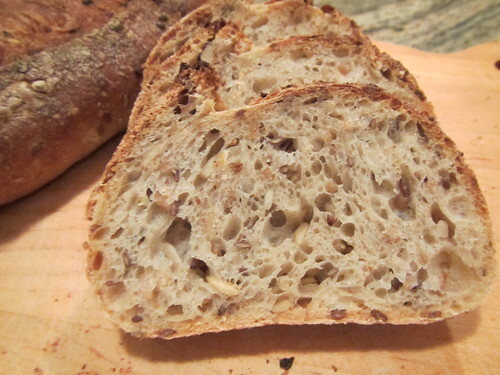 Most of my baking is the tried-and-true standards: a variety of sourdoughs, fruit-nut breads like Reinhart's Cinnamon-Raisin-Walnut, an occasional challah, bagels, pizza. 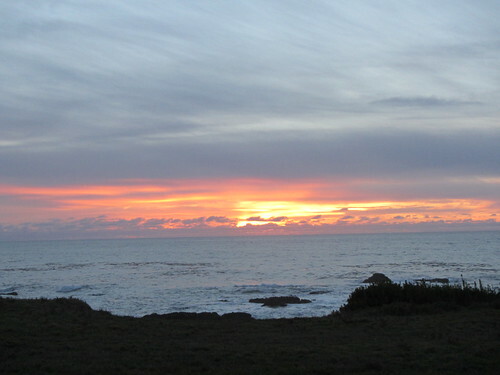 And, obviously, I haven't been blogging. Some time I'll get into some new experiments worth sharing. 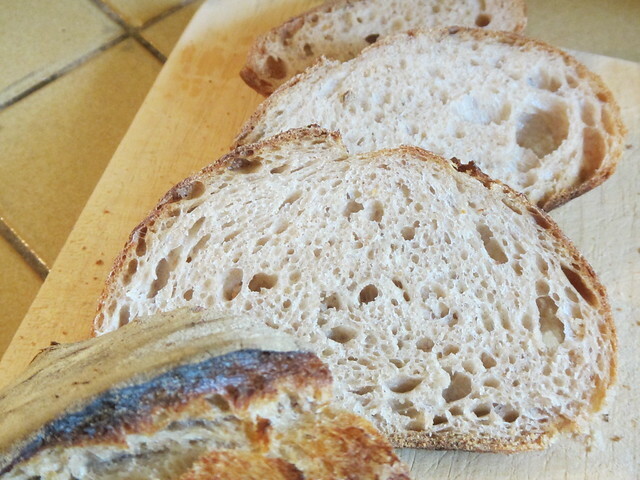 The photo above is today's bake of the San Francisco Country Sourdough I've posted about many times. One of the moistest, tenderest crumbs ever. Perfect for sopping up the juices of the charcoal-broiled ribeye with garlic-shallot butter...perhaps the last barbecue of the year, with Daylight Savings Time around the corner. Cat and I are heading to Edinburgh, Scotland in a couple weeks, with a side trip to Glasgow. Any bakeries there I mustn't miss? I haven’t been around TFL much for the last few months. Work demands, some travelling, and a bum leg conspired to keep me from baking much. And most of my baking has been ordinary…hardly blog-worthy. I’ve missed you all, and thought I’d pop in with a report on some recent bakes. 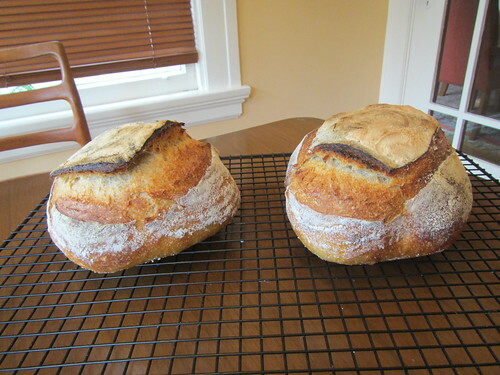 I baked up more of Hamelman’s 5-Grain Levain, this time making one batch into 6 mini-batards. 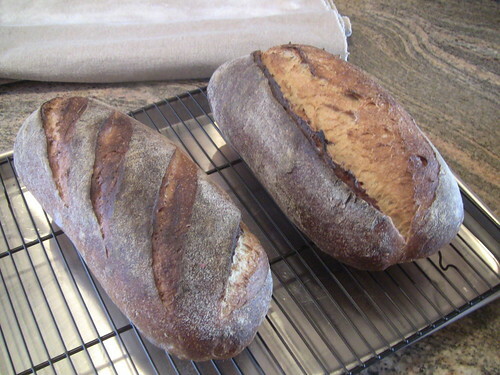 They freeze nicely and one of these loaves is good for a couple days of hardy yumminess. I’ve been working on my pizza crust, using the recipe from my neighborhood joint, Pizzeta 211 (http://www.sunset.com/food-wine/techniques/pizza-00400000063254/). The dough is mixed for 25-30 minutes on low speed, adding the last half cup of flour gradually. 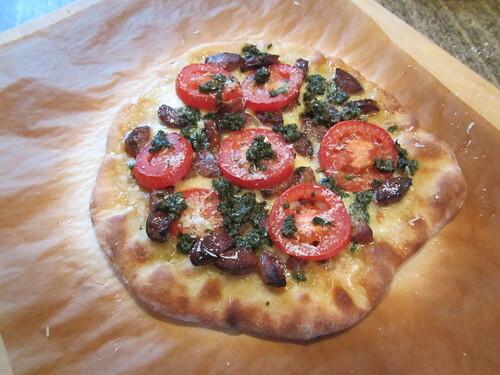 It shapes nicely into a very thin crust, and comes out tender but crispy. 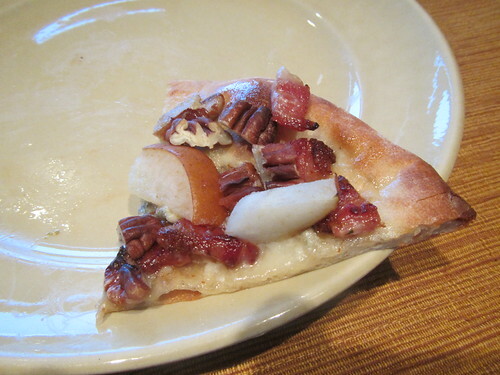 Here are a sausage, tomato, mozzarella and pesto pie and a pear, bacon, pecan and gorgonzola pie. 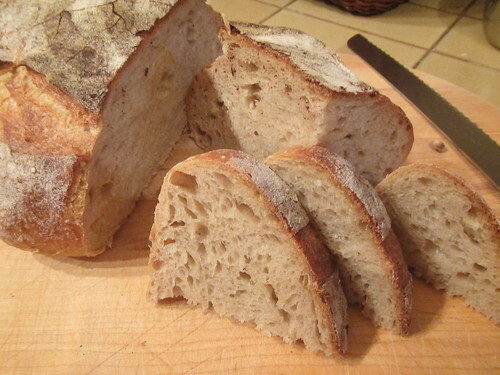 The downside of not baking 3 or 4 times a month is you can run out of bread [gasp!]. 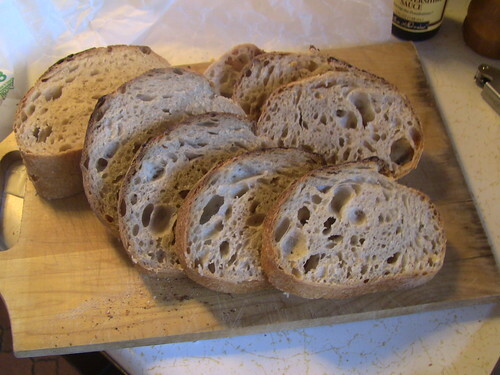 So, this weekend, with no sourdough in the freezer, I did an emergency bake of my San Francisco Country Sourdough. 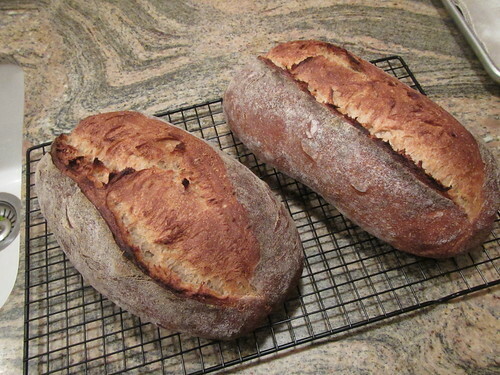 Made two crusty boules. A little out of round, but taste and texture as good as ever. I guess I didn’t lose my touch. 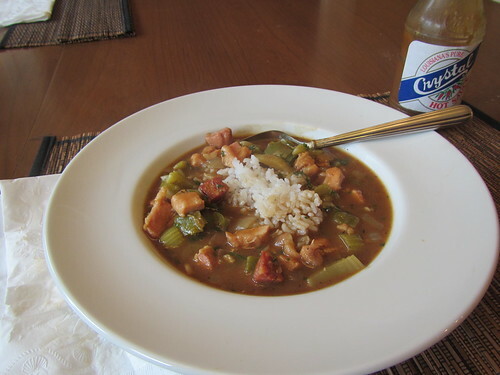 I also managed to make a big pot of spicy fried chicken and sausage gumbo to take the chill off the cool San Francisco Summer weather. With any luck, I’ll be baking and blogging more in the next while than I did in recent months. 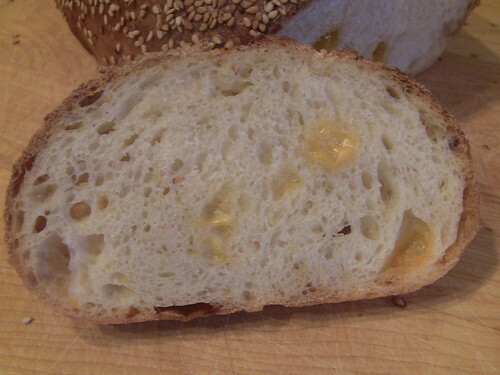 This is a variation on Hamelman’s Cheese Bread, using Cheddar and Jarslberg instead of Parmasen, and sprinkling Sesame Seeds on the loaves. It all started because the fridge was full of cheese. And I love cheese breads. 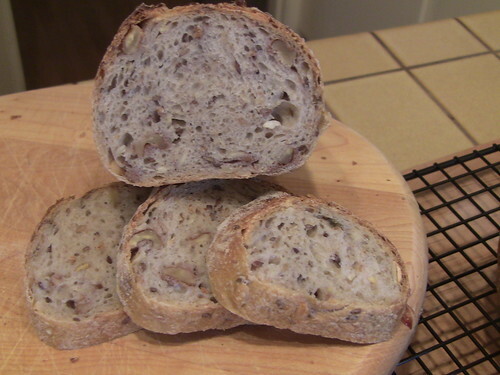 I have made the Cheese Board’s Onion-Curry Cheese Bread (http://www.thefreshloaf.com/node/22549/some-spice-breads-%E2%80%93-one-sweet-and-one-savory) many times. But I wanted to try something new. So I flipped through several baking books, and found Hamelman’s Cheese Bread to be a good starting point. 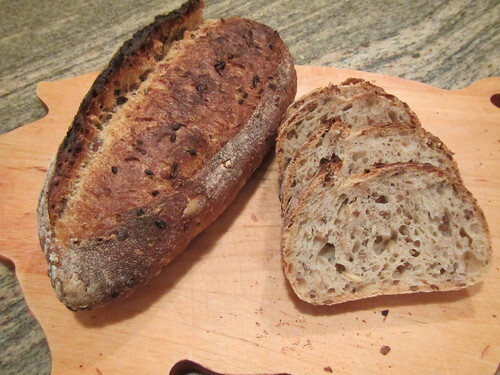 I used a very active starter, left over from the Tartine Basic Country Bread, as the seed culture, and made the stiff levain per Hamelman’s formula. The final dough was also from the Hamelman formula, but I substituted the surplus cheeses (sharp Cheddar and Jarlsberg) for the Parmesan in Hamelman’s formula. 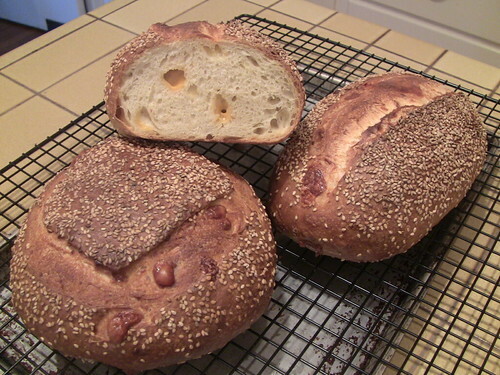 And I topped the proofed loaves with a light egg wash and sesame seeds just before scoring and baking. 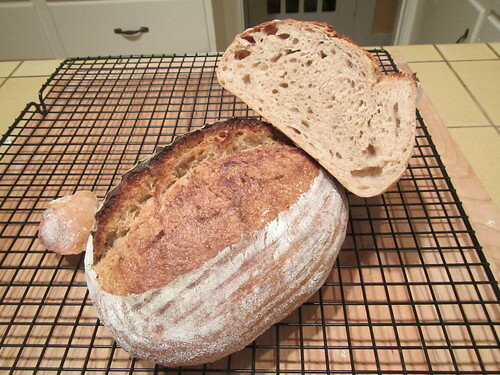 I recommend using parchment under the loaves to keep the mess off your baking stone. Here’s the formula and procedure. 1. Make the levain about 12 hours before mixing the dough. Cover and let ripen at room temperature. 2. Mix all final dough ingredients, except the cheese, at low speed for 3 minutes, then at medium speed for 3 minutes, to moderate gluten formation. The dough should be quite stiff. Add cheese and mix on low speed just until incorporated. 3. Scrape the dough onto a board, round up into a ball and place in a lightly oiled bowl. Cover the bowl and let ferment about 2 ½ hours, with folds at 50 minutes and 100 minutes. 4. 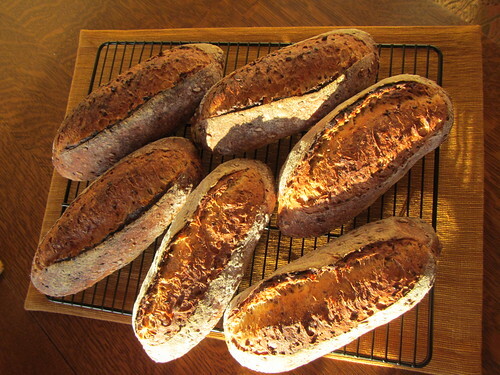 Divide into two or three loaves, pre-shape into rounds and let rest, covered, for 15-20 minutes. 5. 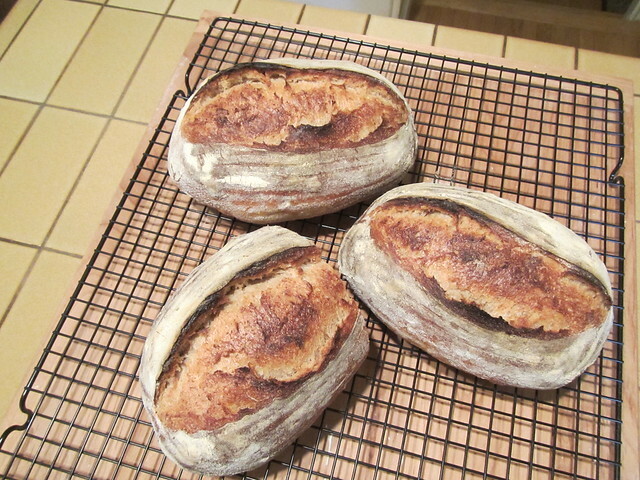 Shape into boules or batards and proof about 1 ½ to 2 hours at room temperature. 6. Pre-heat oven to 500 F, with stone in place and steaming apparatus of choice (I used cast-iron skillet with lava rocks, plus Sylvia’s steamy towels). 7. When proofing complete, move loaves to parchment covered peel. 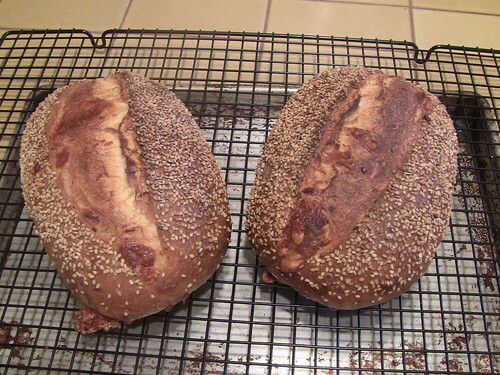 Brush loaves lightly with egg wash, and sprinkle with sesame seeds. Then score the loaves , slide the parchment paper onto the oven stone, and steam the oven. 8. As soon as the loaves are in the oven, reduce heat to 450 F. Bake with steam for 18 minutes, remove steam apparatus, reduce heat to 400 F, and bake another 16-18 minutes (too internal temperature of 206-207 F). 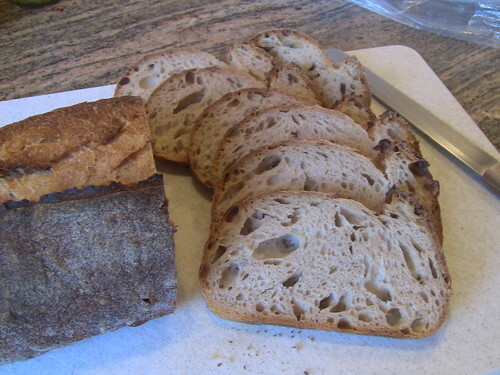 This bread is amazing when almost, but not quite, cooled. And it makes nice toast. 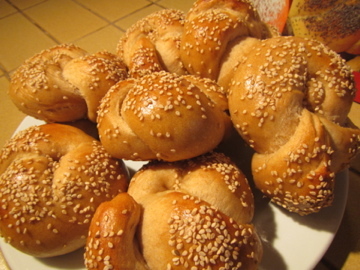 The combination of cheese and sesame is really good! This is true in bread baking, of course. We are all more or less methodical, trying to get everything just right. But everything is never just right. Then, something inexplicably wonderful happens and the best bread ever known comes out of your oven. And it’s either because you’re amazingly skillful, or pixies, leprechauns, angels or karma paid a visit. In my case, I would bet it’s pixies. The same is true in photography (that’s why they’re called “pixels”). Yesterday was a lucky day both for bread and photography. 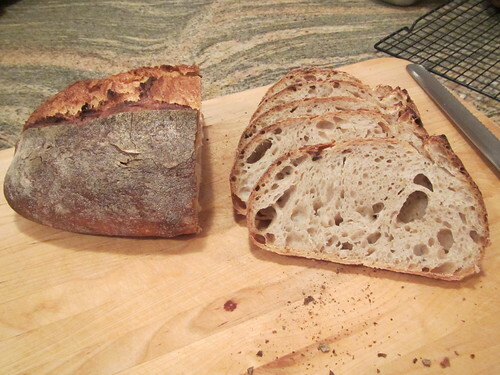 The bread was Hamelman’s Five Grain Levain, a bread I’ve made 5 or 6 times. 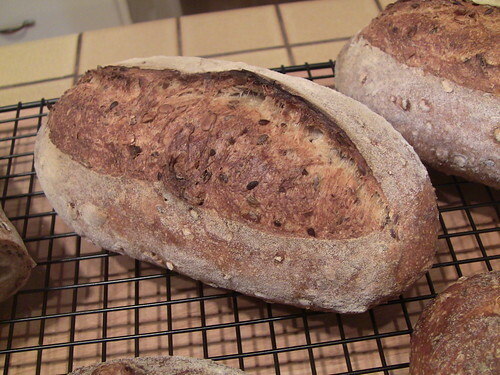 This time I used real cracked rye—as called for in the formula—instead of the cracked wheat I’d been using. 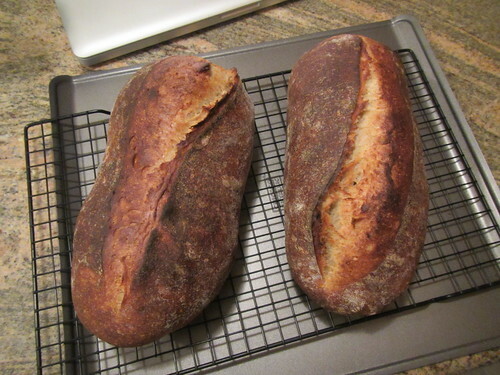 And I scaled the dough into six mini-batards (or short, chubby baguettes). 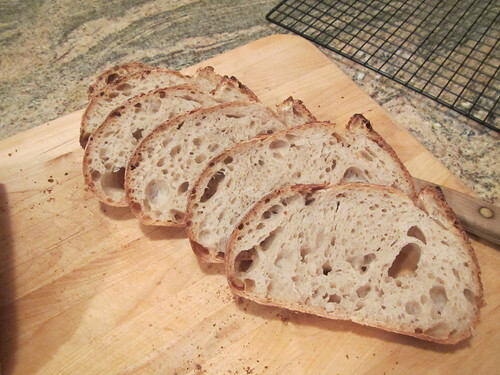 They came out spectacularly well—crust, crumb, ears, spring, flavor. Then, of course, I had to capture them on camera. So I pulled out my new underwater camera, placed the cooling loaves in the sunny dining room, and … PIXIES!! The shots below are in more ordinary light, but still nice. May luck visit you all.